Room size: 24' w x 12' d x 8' h [sloping ceiling] in long-wall orientation. Snake oil or breakthrough? That's the question that ran through my mind when I first heard of Bybee Quantum Purifiers. Jack Bybee is a physicist whose work in Quantum Physics led to the development of the Quantum Purifiers for certain military applications, some of which are still classified. Until five years ago, Jack offered versions of these filters to audio and video enthusiasts keen to improve the level of signal purity in their home systems. Since that time, the products have been off the market but Jack is now back with an improved range of products using refinements of the original technology containing improved materials. These are the new carbon fiber-based Slipstream Quantum Purifiers. He also has a silver and carbon fiber version designed for digital circuitry. They both measure one third of an inch in diameter and one inch in length. The compact dimensions of these filters have allowed Jack to develop a new broader range of products incorporating the Purifiers, and it also makes it easier to introduce the Purifiers at key points in the circuitry of electronic components and speakers. For example, in his Level-2 modifications to the Denon DVD-5900 universal machine, Chris Johnson of the Parts Connexion includes a pair of 'pure silver' Slipstream Quantum Purifiers at the main audio outputs (just prior to the RCA jacks) and a regular pair at the AC input (primary side of the power transformer). If you want to incorporate Quantum Purifiers into your system, you have a wide choice of methods. You can buy hardware from a list of manufacturers who have chosen to include them in their electronics and speakers. If you have the skills, you can insert Jack's devices inside your components (at the inputs and the outputs) or build them into your speakers or even cables. Or you can have professionals do it for you if this is beyond your abilities. You can buy power cables, interconnects or speaker cables with Quantum Purifiers already built in or use one of the Magic Bullet products, which extend your existing interconnect cables by a short length like a pigtail. And that's the subject of today's test - a short addition to a balanced interconnect. You can also acquire Power Chargers or Speaker Chargers that perform similar functions as extensions to your power or speaker cables. Okay, so what's a Quantum Purifier? Click here if you want the whole story. For an extracted quote, here goes:"Bybee Quantum Purifiers operate on the quantum mechanical level to regulate the flow of electrons that make up the signal (picture a metering light regulating freeway traffic flow). Current flow within the Quantum Purifier is unimpeded and ideal (think of the unencumbered flow of traffic on a lightly traveled expressway). During transit through the Quantum Purifier, quantum noise energy is stripped off the electrons, streamlining their flow through ensuing conductors. Unwanted quantum noise energy dissipates as heat within the Quantum Purifier rather than emerging as a layer of contamination residue over the audio/video information." 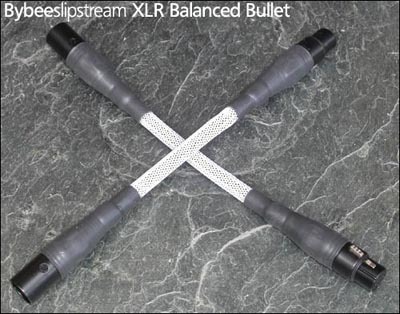 About the Slipstream XLR Magic Bullet, Jack writes the following: "Within each XLR Magic Bullet, carbon fiber Slipstream Quantum Purifiers operate on the signal, return and ground paths. Premium Neutrik XLR connectors attach the Magic Bullets to the downstream ends of your interconnect cables." The device is about 11" in length, with a flexible white mesh-covered cable of about four inches terminated with a rigid black Neutrik XLR female on one end and the male equivalent on the other. The Quantum Purifiers are mounted just behind the Neutrik plugs inside the hard casing. The finish is of a high quality. I connected these cables at the amplifier end of my balanced Soundstrings interconnects between the Meridian CD player and Perreaux Radiance R200i. On Jack's recommendation, I passed signal through the devices for 100 hours before commencing my evaluation in earnest. I played a variety of music but any one piece would have been enough - the results were remarkably consistent throughout: The music gained in coherence and clarity. In every case, I preferred listening with the Slipstream Clarifiers in the circuit. During Peter Schreier's beautiful recording of Mozart's Requiem [Philips 411 420-2], the sound with the Bybees in the circuit actually deteriorated badly because I started singing along with the "Kyrie". Clamping my jaws shut, I listened again. The small degree of sibilance which is present in my regular setup was reduced although not eliminated. Transparency increased slightly and the bass notes from the orchestra came through more clearly. These changes, though small, combined to increase the sense of involvement enough to get me singing. And that's a good thing. Dinu Lipatti's transcendental performance of Bach's "Partita in B Flat" from Great Pianists of the 20th Century [Philips 456 893-2] comes as close to perfection as any I know of. But the sound, recorded in July of 1950 just before his untimely death, does not do justice to his artistry. Although the version offered on this disc improves sonically on earlier releases, I would pay good money for any device that could improve it further. Unfortunately, the Bybee Purifier improved the shallow sound just a fraction with slightly stronger bass and a small edge in the musicality of the piano tone. I wondered how the Purifiers would cope with a much more complex and massive mix of instruments, so I tried Klemperer's rugged performance of Bruckner's 6th Symphony with the New Philharmonia Orchestra [EMI Classics 7243 5 67037 2 8]. This recording dates from 1964 and features the fine acoustics of London's Kingsway Hall. Without the Bybees, I enjoyed the spacious perspective of the divided strings and particularly the pizzicato playing in the third movement of the "Scherzo". The brass sounded raucous and raspy but a bit thin, the climaxes somewhat constricted. Adding the Bybee Purifiers made the sound clearer and more involving, and the string tone improved noticeably. Best of all, the climaxes were uncongested and more thrilling. For a change of pace, I spun "All You Need Is Love" from one of the few Beatles discs I know to have outstanding sound  Yellow Submarine Songtrack [Capitol 7243 5 21481 2 7]. Without the Bybees, the sound was clear but shallow, slightly thin particularly in the strings and the trumpets lacked body, although there was an abundance of detail and a fine sense of space. With the Bybees in circuit, the bass increased in punchiness and vocals grew clearer. I heard details in the mix I had never heard before, like a particular piano phrase at 2:17 into the track. The sound was warmer than before, with more body to the string tone. My findings were not as dramatic as some reviewers have reported but these devices proved to make clear and significant improvements without any downsides except for the hefty price of admission - $880pr. The better your system of today, the more expensive it becomes to get meaningful improvements. Hence these products make the most sense for high-end systems otherwise already assembled close to completion. I like the offer of trying these products in your own home for 30 days. Best of all is the rich variety of ways in which one can implement this technology in one's system. What kind of system do you have at home, Jack? For more than 15 years now, I have been listening to 3-way time-aligned speakers with subwoofers which I designed and built. Sometimes I listen to my Stax Lambda Pro headphones. Source components are a Win SP-10 turntable with Graham 2.2 arm and Cardas Reference cartridge, a Dodson DA-218 DAC with heavily modified Pioneer 434 DVD player for a transport. Then add the CTC Blowtorch line stage and Vendetta Research phono stage (both upgraded to current spec by John Curl) and Aragon's 4004 power amplifier, also heavily modified. All cables are of my own design. I am also using a prototype of the active Vice-Bybee power conditioner - negotiations for manufacture and distribution of that product are underway. How did you make your original breakthrough? I led an R& team under contract to the Navy. The original project was to eliminate quantum-level noise in the battery power supplies of nuclear submarines, which was interfering with their extremely sensitive passive sonar systems. That led to numerous additional military applications as well as the kind of consumer applications with which I'm currently working. If adding one Slipstream Purifier improves the sound, do you get a further improvement if you daisy- chain two or more? Yes, the results of adding additional purifiers appear to be almost instantly accumulative. One example is one of my OEM customers, Talon Audio. They're now putting two purifiers at both the + and - terminals of each driver although I basically recommend just one at each terminal for DIY modifications. Can you explain how you developed your original products into the current range which is smaller, less expensive and of higher performance? The new Slipstream purifiers are the result of breakthrough applications in carbon fiber and nanotechnology. How can you add something in series and not add any distortions to the signal path? Beats me. But the measurements prove that it works. Where is the ideal place to introduce the Slipstream Purifiers into the signal path? For best results, the general rule is as far downstream as possible. That would make the loudspeaker driver terminals the theoretical optimum location. Does adding a Slipstream Purifier inside a component invalidate the warranty? That's up to the original manufacturer - probably 'affirmative' in many cases. But there are now literally hundreds of Bybee-modified components in use and I am not aware of a single failure caused by a properly installed Bybee Quantum Purifier. Do you get many people returning their purchases within the 30-day money back period? So far it amounts to a grand total of one. There will be new and improved products for audio/video and I am exploring applications for this technology outside of consumer electronics. Thanks for speaking with me today, Jack.